Blow off the dust, wipe away the cobwebs and go forward without fear with this encouraging new workshop by Wanda Howe, eRYT500 and Heather Overton, eRYT200, RYT500. 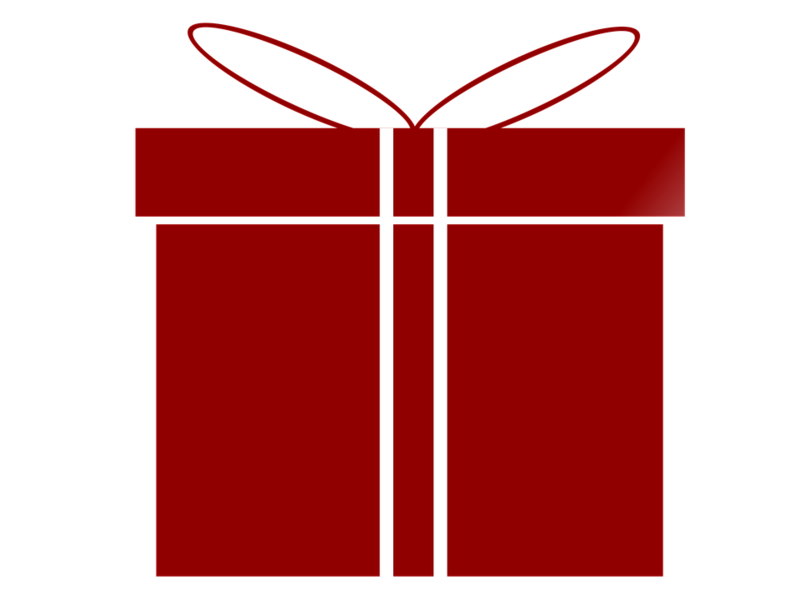 This continuation of "New Year New Practice" brings new ways of looking at your practice. Acquire the building blocks to strengthen your foundation, release your fears and have fun on your mat. Join these two experienced yoga instructors for a truly joyous journey, one not to be missed!! Open to all levels of experience. New Year New Practice #1 not required to attend. 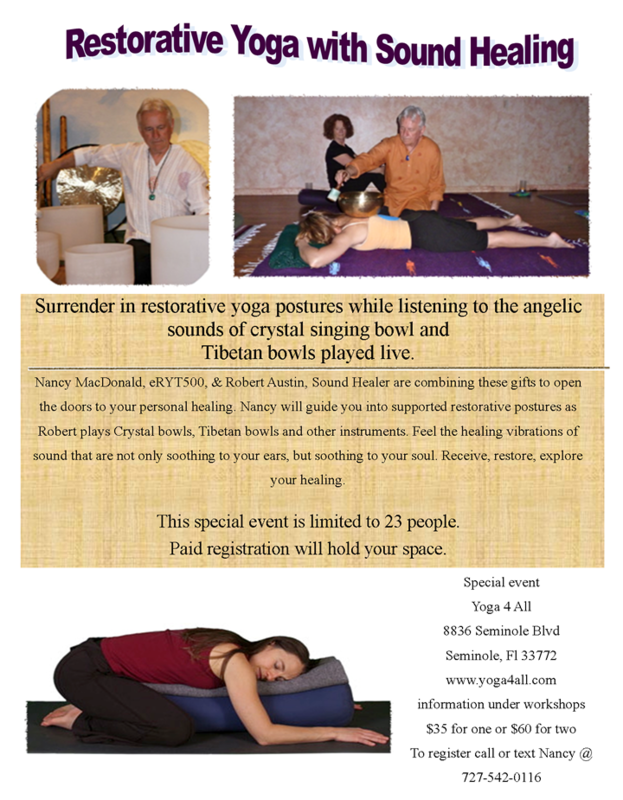 Workshop will include relaxation/meditation. Registration fee $35. Walk-in permitted on a space available basis only with instructor permission. 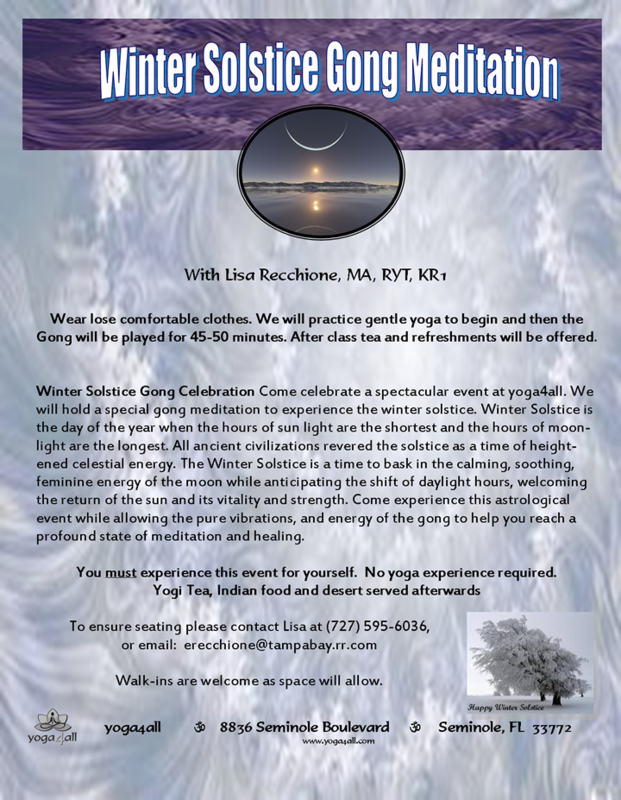 This is a monthly event with Lisa Recchione, RYT500, E-RYT 200 and may be scheduled close to either the new moon or the full moon. The Gong has all the sounds and vibrations of creations within it. It cancels out thoughts and allows you to completely relax very deeply and quickly. The mind is overcome and relaxed by the gong so that a very deep state of meditation can be reached. In this state, deep healing occurs and awareness is heightened. 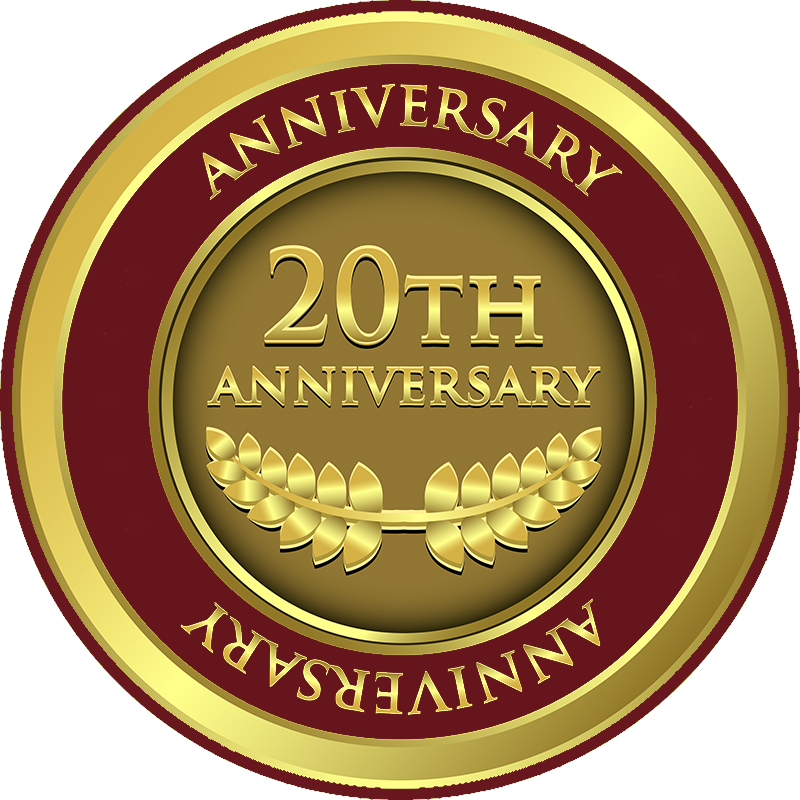 It is suitable for all levels of practitioners with no experience necessary. Wear loose, comfortable clothes. Every ancient tradition holds the gong sacred as an instrument for deep transformation. In the east the gong is believed to hold the sounds and vibrations of the universe. These vibrations quickly quit the mind and resonate within the body to free energy and break through blocks. The gong clears emotional, energetic and physical blocks and allows one to tune into the universal frequency. It is a very powerful tool to promote healing, manifestation and the state of deep awareness. The gong class begins with gentle yoga and pranayam to tune in and open. Then the person lies down comfortably, completely relaxed, and experiences the gong which is played for about 45 minutes. People have described this experience as being profound, extraordinary and even life altering. A new moon is a time to release old patterns and start new projections. 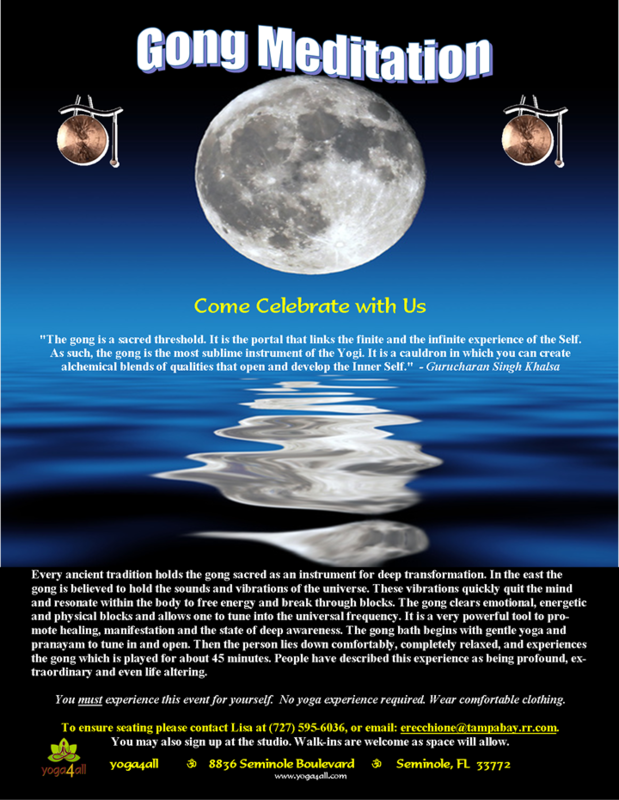 The full moon is a time of heightened energy to promote healing and manifestation. The equinox is the time where sun and moon are equal. The energies are balanced. The Autumnal Equinox marks the beginning of Fall. The balance of the sun and moon allow for balance of mind and integration of self. The Winter Solstice Is the shortest day of sunlight. It is a heightened time of moon energy and allows for deeper meditation and awareness. It is a wonderful time to project and manifest. To register, call List at 727-595-6036. Pay to reserve your space. Walk-ins welcome depending on availability. 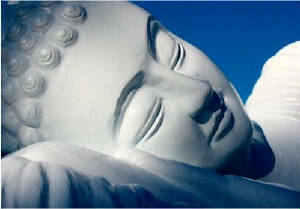 Yoga Nidra the yogic sleep. Is not sleeping at all it is a meditation practice where you go past the "dreaming state" into the brain wave state of "deep sleep", yet remain awake. A state of awareness that can have a tremendous soothing effect on the mind by freeing it from unresolved tensions that have been stored in the body/mind. In ordinary sleep tensions are often unresolved and pushed down deeper into the self sometimes manifesting dis-ease of the body, mind and spirit. Yoga Nidra, however, is a different method of meditation and state of mind in that it works on the states of mind that actually create and sustain inner conflict. It is a place where burdens can be let go and old stories that loop through the mind can be released. Unlike sleep in yoga nidra you are in charge of your experience. In our studio before the yoga nidra session you will be taught how to set a mental resolve known as a Sankalpa in yoga nidra. Sankalpa’s can be very powerful and effective to enhance life’s changes. Sankalpa’s can be many things but stated with awareness and being spoken from the heart the universe hears these heart felt words and life responds. If your Sankalpa does not spring from your heart right away, not to worry we have some suggestions you can choose from until your personal Sankalpa becomes clear. The practice of Yoga Nidra is like planting a seed, watering it, loving it and soon the practice takes root and grows into a beautiful part of your life. Allowing you to grow and bloom into your unique magnificence. The practice enhances any meditation practice as well as any mind body practices you may already have in your life. Lie down in Savasana, making sure you are very comfortable. Breath awareness, following the breath moving in the body. Repeat your Sankalpa your resolve mentally three times with feeling and awareness. The yoga nidra facilitator will begin a rotation of awareness through the body. Naming parts of the body as you draw your attention to it. Example: Draw your attention to your right hand, right hand thumb, index finger, middle finger, ring finger, little finger… etc. The nidra then progresses into a guided imagery of some sort. Ending with repeating your Sankalpa once more mentally 3 times with feeling and awareness. Come join us if you have any questions please call the teacher listed as the Yoga Nidra facilitator and she will be happy to answer any of your questions. Join Heather Overton, eRYT200, RYT500, Experienced Personal Trainer for this therapeutic yoga workshop designed specifically for the inflexible person in you. Find balance in this workshop which focuses on the specific area of tight hamstrings, calves and hips. This therapeutic sequence will help relieve tension in overstressed and overworked muscles. Learn to stretch properly to enhance performance and keep your body healthy. Regardless of your exercise routine, this is one not to be missed. Receive a copy of the sequence to improve your home practice. Open to all levels of fitness. Lynne Andrews, certified TriYoga® teacher. This session includes a variety of flowing sequences for lengthening the spine. Back bending poses strengthen the back and open the heart center Sustained forward bends deepen our inward focus, preparing us for deep relaxation. Join us, in the flow.